Paul Bollenback's "Brightness of Being"
One of my oldest friends, jazz guitarist Paul Bollenback, has released his latest CD, "Brightness of Being" , with yet another all star line-up. Saxophonists David "Fathead" Newman, Gary Thomas and Tim Garland, vocalist Chris McNulty, drummers Teri-Lynne Carrington and Ari Honnig, and bassist James Genus. "Being" is Bollenback's sixth album, and like a fine wine, he keeps getting better. "Luap", as I've affectionally come to know him, has out done himself once again wth this very fine effort. "Not one jazz virtuoso could put the definition of jazz into words, but all agreed that you know it when you hear it. That's the way it is with Paul Bollenback. It's bona-fide playing, unambiguous, up-front and powerful," summarized guitar master George Benson, a long-time supporter. Bollenback’s debut recording as a leader, "Original Visions", on Challenge Records, is one of the most creative efforts by a guitarist in recent memory. "Double Gemini", his second CD, features four of his own compositions and won the title of CD of The Month in Jim Fisch's distinguished jazz column in 20th Century Guitar Magazine. It won the same award from the renowned jazz radio station WBGO in Newark, New Jersey. His 3rd release on Challenge, "Soul Grooves", won ‘Ndigo Magazines “Best Contemporary Jazz Album of 1999”. Challenge has since released “Dreams” and “Double-Vision”, and now Bollenback has released his 6th project as a leader, "Brightness of Being", on the Elefant Dreams label, in February 2006. 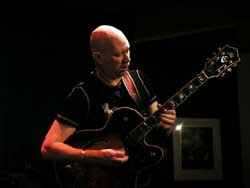 Bollenback's emotionally expressive style and eclectic approach is the result of a wide range of influences, including Carlos Santana, Yes, Wes Montgomery, George Benson, Kenny Burrell, Herbie Hancock, Bill Evans, John Coltrane, Wayne Shorter, John McLaughlin, Jimi Hendrix, Johnny Winter and Lenny Breau. At the age of seven, he received a nylon-string guitar from his father, a scientist, classically trained trumpeter and lover of music. When Bollenback was eleven, his family relocated from Hastings on Hudson, New York, to New Delhi, India. It was there that he cultivated his life-long interest in exotic musical sounds and timbres, which is evident in even his most jazz-based work. When his family returned to New York, Paul's father bought him an electric guitar and he started to gig in rock and roll bands around the area. Then he heard Miles Davis and his world changed forever. Having relocated again in 1975, this time from New York to Washington, D.C., Bollenback continued to study and play jazz and fusion, (Our first D.C. jazz/fusion combo also featured the renown bassist Ed Howard and saxophonist Tim Chambers). Bollenback attended University of Miami as a music major, then later studied privately for eight years with Baltimore-based professor of Theory/Composition Asher Zlotnik. In 1987 he made his recording debut on saxophonist Gary Thomas’s Seventh Quadrant, for Enja records, and in 1990 made the acquaintance of organ legend Joey DeFrancesco, an association that lasted 16 years, and produced 14 recordings. In 1991 his two compositions, "Wookies's Revenge" and "Romancin' the Moon" (featured on Joey DeFrancesco's Reboppin') earned him the SESAC award for original music. 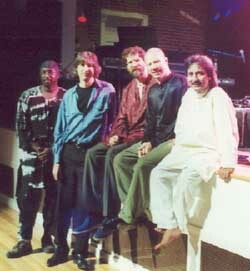 In 1993 while touring in Europe, Paul was awarded a grant from the Virginia Commission on the Arts and the National Endowment for the Arts to compose and perform "New Music for Three Jazz Guitars". In 1997, Bollenback was named Musician of the Year at the Washington Area Music Awards. In 1997 Bollenback returned to New York City, which he now makes his home. Since then, Bollenback has appeared on the Tonight Show, Good Morning America, Joan Rivers, The Today Show, and Entertainment Tonight. He has played with an impressive spectrum of musicians, including Stanley Turrentine, Gary Bartz, Joey DeFrancesco, Jeff “Tain” Watts, Joe Locke, Gary Thomas, Chris McNulty, Tim Garland, David “Fathead” Newman, Steve Wilson, Geoffrey Keezer, Terri-Lyne-Carrington, Grady Tate, , Shunzo Ohno, James Moody, Jack McDuff, Charlie Byrd, Paul Bley, Carol Sloane, , Melissa Walker, Carter Jefferson, Herb Ellis, Jimmy Bruno, and East Meets Jazz, with Sandip Burman, and Howard Levy. In his review of "Being", All About Jazz editor John Kelman wrote, "While unequivocally mainstream, Brightness of Being is no retro relic. There’s nary a standard to be found, although Bollenback places some contemporary songs into straightahead but fluidly open contexts. Saxophonist David “Fathead” Newman appears on two tributes to the late Ray Charles: “Unchain My Heart,” which has a ‘60s Blue Note soul-jazz vibe; and “You Don’t Know Me,” which Bollenback relocates from country juke joint to late night smoky bar. But Bollenback interprets even familiar material with an open-minded and unencumbered approach. He constructs his solos every bit as well as Pat Metheny does, but they somehow feel looser. He thinks fast on his feet, effortlessly shifting from clean lines to complex chordal passages, yet always relying on a clear conception and strong narrative development. Bollenback reinvents Stevie Wonder’s “Don’t You Worry ‘Bout a Thing,” which also features saxophonists Gary Thomas and Tim Garland. Opening almost unrecognizably, the three players enter a heated exchange, ultimately finding their way to the complex chord changes that bridge the chorus and verse. They respect Wonder’s melodicism, but Bollenback proves adept at improvising in ways that might seem reckless if they didn’t make so much sense. The song ultimately ends as it began—Bollenback, Garland and Thomas in virtual free fall, with bassist James Genus and drummer Terri-Lyne Carrington offering intuitive and responsive support. Bollenback’s ability to envision greater possibilities is especially vivid in his adaptation of Garcia de Leon’s “El Desierto,” which starts as a gentle tone poem but then picks up steam for his solo. Again, he skirts the edges of abandon but never loses focus—a characteristic equally applicable to Garland’s nimble soprano solo. Bollenback’s imaginative three-part adaptation of Puccini’s “Dark Eyes of Floria” from Tosca moves from freedom to form, temporal elasticity to loose swing, change-based improvisation to more open-ended modality. Bollenback’s writing demonstrates similar adaptability. “Together” may sound straightforward, but its inherent complexity challenges everyone to find common melodic threads. The gently Latin-inflected “Breathe,” where Bollenback plays classical guitar, features Chris McNulty’s sultry tone in a Norma Winstone-like wordless vocal. The set closes with “Siberian Passages,” another deceptive piece where McNulty again mirrors Bollenback, who manages to make the elaborate flow with ease while retaining a simmering intensity. No one album can tell the whole story on Paul Bollenback. But certainly more than any record he's led to date, Brightness of Being demonstrates an out-of-the-box thinker working freely in a compositionally refined yet wholly accessible mainstream context."